Although it may work out well for some light users, we would recommend heavy and regular users to consider other options. To meet your weight loss goals at home, the Gold’s Gym Stridetrainer 380 Elliptical Trainer serves as a decent machine to provide for all your basic needs. With its Silent Magnetic Resistance™ (SMR) technology and 12 levels of resistance, it is useful for customizing your workout experience while operating silently. 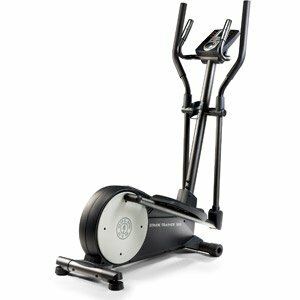 This elliptical comes with six pre-installed workouts and is most suitable for the casual users who are of average weight and height because of its 250 lbs limit and a 14-inch stride length. Considering that it is available on the market for around $300, it is not a bad machine for those who are only starting out their journey towards fitness. Although, we can safely say that there might be better alternatives available in the market. Decent customizability of workouts as an affordable cross trainer. Digital resistance and the use of Silent Magnetic Resistance technology. Lightweight convenient for moving around at home. The trainer has both Moving and Stationary handlebars. Pulse monitors on both the stationary bars for better insight into workouts. Low number of programs in comparison to industry standards. Short term warranty (90 days). Known to get noisy after some usage. Inconvenient for users who are above average height due to short 14″ stride length. Does not support users who weigh more than 250 lbs. Runs on four D cell batteries and has no power cord. Digital SMR (Silent Magnetic Resistance) technology. Dual Grip Power Pulse Heart Rate Monitor. A blue-tinted LCD to keep track of heart rate, speed, distance, etc. Uses a rear drive system. 14″ stride length with adequately sized pedals. Maximum user weight of 250 pounds. 55″L x 26″ W footprint. Owns convenient transport wheels for better mobility. Lightweight, with the machine being around 100 lbs. Battery operated (four D – cell batteries required). The Gold’s Gym Stride Trainer 380, as promised, provides a low impact workout system that puts less strain on your joints. But overall, the long-term performance of this machine is questionable as a significant number of its users complain about the quality of its components. One of the biggest negative aspects is that people above the average height will inevitably face difficulties with the stride length of just 14″. Reviewers often complain about it looking cheap, squeaking noises (even with the SMR technology) after some use and even about the metal frame breaking down after a couple of months of regular workouts. The sturdiness of this machines is slightly off the standards you would expect from a brand like Gold’s Gym. With regular and longer usage, the SMR seems to fail at its task. Its fragile build is only suitable for lightweights and is known to cause problems with excessive use. A short 90-day warranty only makes it riskier for buyers who are in it for the long run. The assembly of this product is another aspect that people are not too fond of. Although it comes with a manual, buyers often report problems with missing parts and pieces that don’t fit together properly. Some say that it is a two-person job (unless someone is already experienced). Given the price range, this product gives customers a hit-or-miss scenario – it depends on how you use it. Although it may work out well for some light users, we would recommend heavy and regular users to consider other options. Do not expect this to last you a couple of years, because it most probably will not. In our opinion, paying the extra bucks for a better Schwinn, Proform or even the Gold’s Gym Stride Trainer 410 would be more worth your money.